In this study, we aimed at disclosing the main features of paroxysmal nocturnal hemoglobinuria (PNH) clones, their association with presentation syndromes, and their changes during follow-up. A large-scale, cooperative collection (583 clones from 529 patients) of flow cytometric and clinical data was entered into a national repository. Reason for testing guidelines were provided to the 41 participating laboratories, which followed the 2010 technical recommendations for PNH testing by Borowitz. Subsequently, the 30 second-level laboratories adopted the 2012 guidelines for high-resolution PNH testing, both upon order by the local clinicians and as an independent laboratory initiative in selected cases. Type3 and Type2 PNH clones (total and partial absence of glycosyl-phosphatidyl-inositol-anchor, respectively) were simultaneously present in 54 patients. In these patients, Type3 component was sevenfold larger than Type2 (p < 0.001). Frequency distribution analysis of solitary Type3 clone size (N = 442) evidenced two discrete patterns: small (20% of peripheral neutrophils) and large (> 70%) clones. 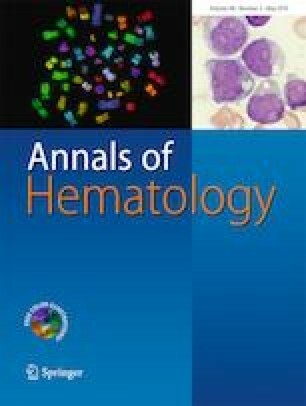 The first pattern was significantly associated with bone marrow failure and myelodysplastic syndromes, the second one with hemolysis, hemoglobinuria, and thrombosis. Pediatric patients (N = 34) showed significant preponderance of small clones and bone marrow failure. The majority of PNH clones involved neutrophils, monocytes, and erythrocytes. Nevertheless, we found clones made exclusively by white cells (N = 13) or erythrocytes (N = 3). Rare cases showed clonal white cells restricted only to monocytes (6 cases) or neutrophils (3 cases). Retesting over 1-year follow-up in 151 cases showed a marked clone size increase in 4 cases and a decrease in 13, demonstrating that early breaking-down of PNH clones is not a rare event (8.6% of cases). This collaborative nationwide study demonstrates a clear-cut difference in size between Type2 and Type3 clones, emphasizes the existence of just two classes of PNH presentations based on Type3 clone size, depicts an asymmetric cellular composition of PNH clones, and documents the possible occurrence of changes in clone size during the follow-up. This study was conceived and coordinated by Luigi Del Vecchio, and the present manuscript is dedicated to his memory. The online version of this article ( https://doi.org/10.1007/s00277-019-03644-8) contains supplementary material, which is available to authorized users. All studies in this paper were performed in accordance with the ethical standards laid down in the 1964 Declaration of Helsinki and its later amendments. All procedures followed were in accordance with the Helsinki Declaration of 1975, as revised in 2008. Although this type of study did not require a formal clearance by ethical committees, all persons gave their informed consent prior to the inclusion of their data in the national repository.